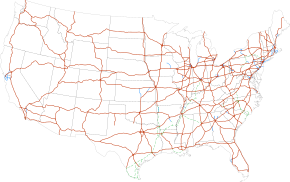 There are 70 primary Interstate Highways in the Interstate Highway System, a network of controlled-access freeways in the United States. They are assigned one- or two-digit route numbers, whereas their associated "auxiliary" Interstate Highways receive three-digit route numbers. Typically, odd-numbered Interstates run south-north, with lower numbers in the west and higher numbers in the east; even-numbered Interstates run west-east, with lower numbers in the south and higher numbers in the north. Highways whose route numbers are divisible by "5" usually represent major coast-to-coast or border-to-border routes (ex. I-10 travels from Santa Monica, California, to Jacksonville, Florida, traveling from the Pacific to Atlantic oceans). Additionally, auxiliary highways have their numbering system where a different number prefixes the number of its parent highway. Five route numbers are duplicated in the system, though the corresponding highways are separated by state lines which prevent confusion. The main list that discusses the primary Interstate Highways in the contiguous United States is followed by sections regarding Alaska, Hawaii, and Puerto Rico. There are 70 primary Interstate Highways listed in the table below. Associated routes: None, had one proposed auxiliary route, I-266, but was cancelled due to freeway revolts. Associated routes: None, will eventually have one spur route, I-587. Associated routes: None, had 2 auxiliary routes planned, I-197 and I-297, but they were replaced by I-595 and MD Route 3. The Interstate Highways in the island of Oʻahu, Hawaii are signed with the standard Interstate Highway shield, with the letter "H-" prefixed before the number. They are fully controlled-access routes built to the same standards as the mainland Interstate Highways. 6.5 10.5 — — — — Was to have provided relief around the congested areas of H-1, but the idea was not popular and was never built. Alaska's Interstate Highways are unsigned as such, although they all have state highway numbers that do not match the Interstate Highway numbers. Like Alaska, Puerto Rico signs its Interstate Highways as territorial routes, and the numbers do not match their official Interstate Highway designations. Many of the territory's routes are freeway-standard toll roads. The title of interactive fiction I-0 refers to the fictional "Interstate Zero". ^ Weingroff, Richard F. (Summer 1996). "Federal-Aid Highway Act of 1956, Creating the Interstate System". Public Roads. Washington, DC: Federal Highway Administration. 60 (1). Retrieved March 16, 2012. ^ a b c d Adderley, Kevin (January 30, 2019). "Table 1: Main Routes of the Dwight D. Eisenhower National System of Interstate and Defense Highways as of December 31, 2017". Route Log and Finder List. Federal Highway Administration. ^ Staff. "FHWA Route Log and Finder List". Federal Highway Administration. Retrieved May 24, 2007. ^ Voss, Oscar. "Alaska Roads: Interstate ends photos". Retrieved May 24, 2007. ^ a b c Witt, Jennifer W. (2010). Annual Traffic Volume Report (PDF) (Report) (2008-2009-2010 ed.). Alaska Department of Transportation & Public Facilities. Archived from the original (PDF) on March 30, 2014. Retrieved March 15, 2012. ^ a b c Birkholz, Ethan (2010). Annual Traffic Volume Report (PDF) (Report) (2008-2009-2010 ed.). Alaska Department of Transportation & Public Facilities. Archived from the original (PDF) on April 17, 2014. Retrieved May 31, 2012. ^ a b c d Staff. "Dwight D. Eisenhower Interstate Routes Statewide" (PDF). Federal Highway Administration. Retrieved May 31, 2012. ^ a b c d Staff. "Alaska Department of Transportation and Public Facilities Routes by Description: CDS Route Numbers as of 28 October 2008" (PDF). Federal Highway Administration. Retrieved May 31, 2012. ^ Voss, Oscar. "Puerto Rico road photos". Retrieved May 24, 2007. ^ "I-0". Interactive Fiction Database. Retrieved February 1, 2016. This page was last edited on 10 April 2019, at 13:16 (UTC).